Is your author website doing all it can for your career? Does it include the basic elements contained in the most effective websites? I’m not necessarily talking about the best-looking, most beautifully pleasing websites. I’m talking about the author websites that quickly show readers what you write, how to reach you and how to buy your books. The ones that tell the media, other writers, agents and publishers how they can contact you and why. Does your website draw search traffic, or are people searching for you sent elsewhere, places like Facebook, or LinkedIn, or maybe even Amazon? Hi – I’m a (mystery/romance/thriller) author, and I just released a new book. Reviewers are comparing it to the work of (Lee Child/Nora Roberts/David Baldacci,), and I’d love it if you’d interview me on your show. I’ve included the Amazon link to my books below. Here’s the first thing I do when I get one of these pitches. I do a search on the writer’s name with the word author next to it. So – After receiving the email above, I’d search on Samantha Samson Author. Then I go to Samantha’s website. Obviously, I’m not the only one. Thousands of times each day readers, people from the publishing industry and media members do the same thing to find the information they need about an author. How hard should we expect them to look if the information they want isn’t readily available? For most web users it’s just seconds before they click on to the next option. Over time, I’ve learned what elements make up an effective author website. The great news is that most authors can dramatically increase the effectiveness of their website by making a few simple changes. 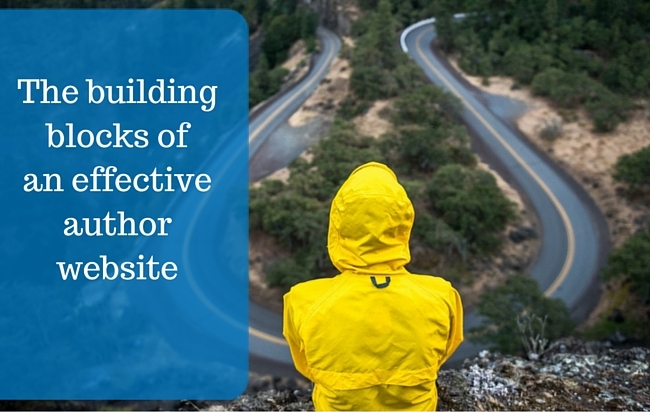 What are the Essential Elements of an Effective Author Website? We believe an effective author website includes six essential elements, and I’m going to cover each of the elements, with a full post devoted to each of them. But before we get there, let’s tackle the obvious question. Why do I even need a website as an author? I’ve got a Facebook page, and I’ve got Twitter, and Instagram, or whatever the social media craze of the minute happens to be right now. There’s one big reason. Your author website should be your home base on the Internet. Your author website should be your home base on the Internet. You should own your home base. I’m not trying to suggest you should have a cookie cutter website that’s the same as every other author out there. But let’s take the idea of a home base a little further. Just like your home is different from mine, your website can and should be uniquely yours, but like any well-built home, the foundation must be solid. You may be living a log cabin in the Rocky Mountains while I’m living in a condo in Florida. But we each have a kitchen, at least one bathroom, a front door, a place to sleep and space to write. Those are the essential elements of our homes. A contact page that will allow readers and others to contact you. These elements can be added in a variety of ways, from the simple to the slightly complex. Throughout this series, you’ll find your own path through this adventure. In the end, you’ll have a website that’s doing the work it was meant to do – helping to grow your author business by keeping your readers informed and engaged. Lesson 1: Why you Should Have a Separate Webpage for Each of Your Books.